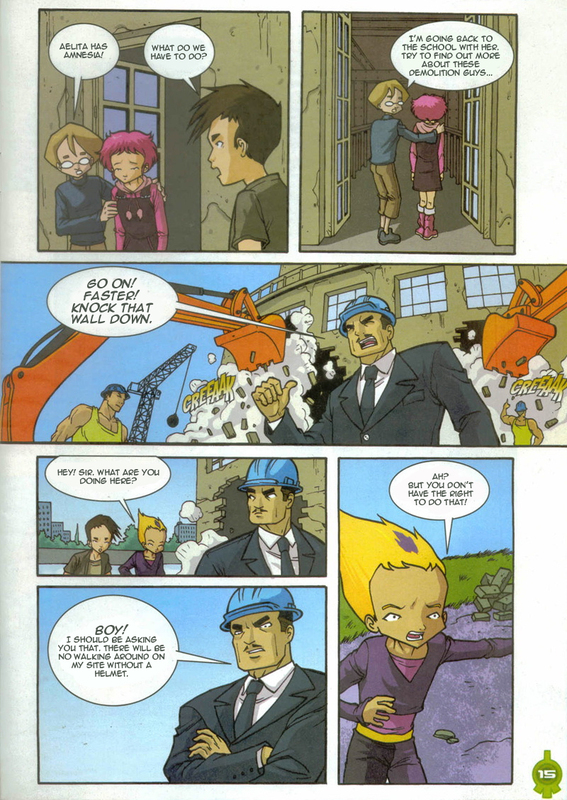 It's a catastrophe for Jeremy, Odd, Aelita and the others: a real estate developer wants to destroy the factory in their local area. 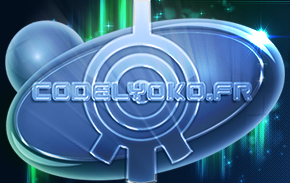 And if the factory is destroyed, access to the world o Lyoko is closed off forever. Our friends must therefore find a solution! And if that wasn't enough, XANA launches an attack. 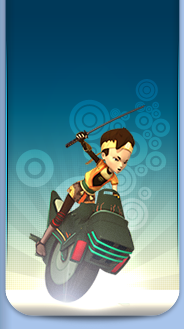 Can the heroes of Code Lyoko stop the crisis and save their factory? The action starts like episode 27: the kids are racing, only this time it’s between Odd and Yumi, but the result is still the same: Odd ends up crashing his vehicle. 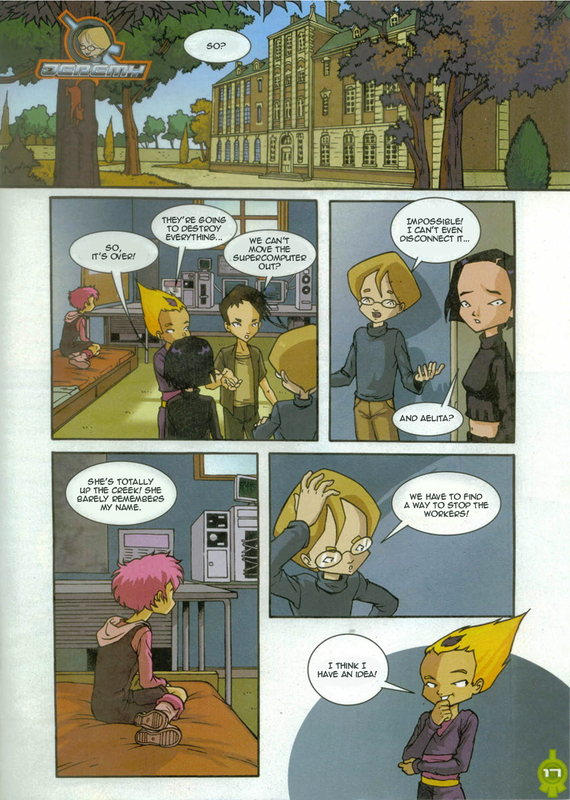 The heroes’ laughter is interrupted by violent earthquakes, affecting the lab as well as Lyoko. Jeremy devirtualises his friends and the heroes go to see what the racket is all about. When they leave, they discover the horror: bulldozers are attacking the factory. Exchanging a few words with the director of the project, a very cold man, the heroes understand that the situation is critical and that the factory will be destroyed to be replaced by new buildings. When they return to the school, the heroes decide to fight back and not let this happen… To stop the machines, Odd tries resorting to sabotage and plugging the exhaust pipes with bananas. His plan would’ve worked, but he’s caught very quickly and the heroes must run for it. Odd persists with his idea, but when he returns with more bananas, there are guard dogs patrolling the site. 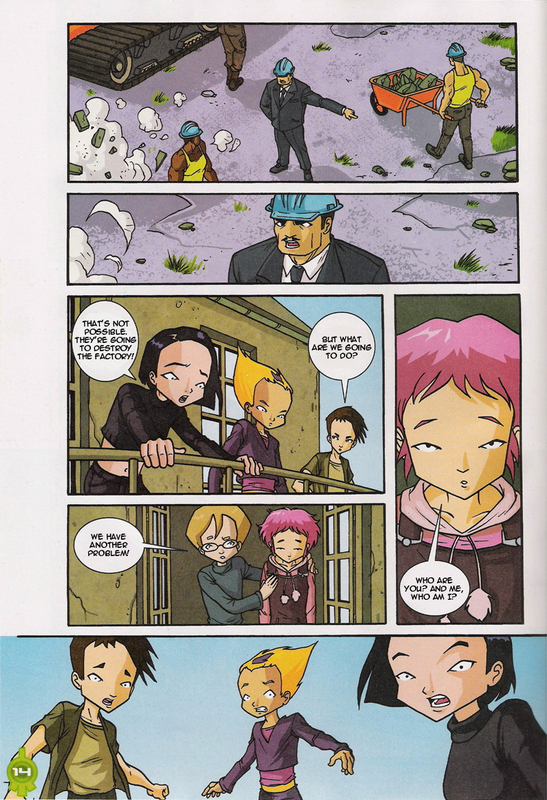 Back at school, Ulrich, Odd and Yumi realise that despite all of Jeremy’s efforts, Aelita’s memory hasn’t come back. 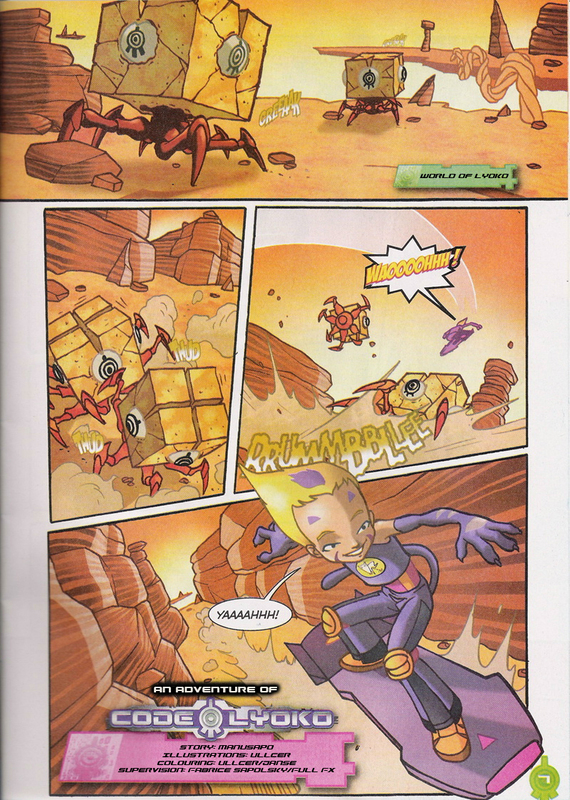 Odd thinks it could be worse…and XANA proves it…by activating a tower!! To get to the factory entrance, Jeremy has a brilliant idea: he uses a feral cat to distract the guard dogs. The heroes enter the factory. 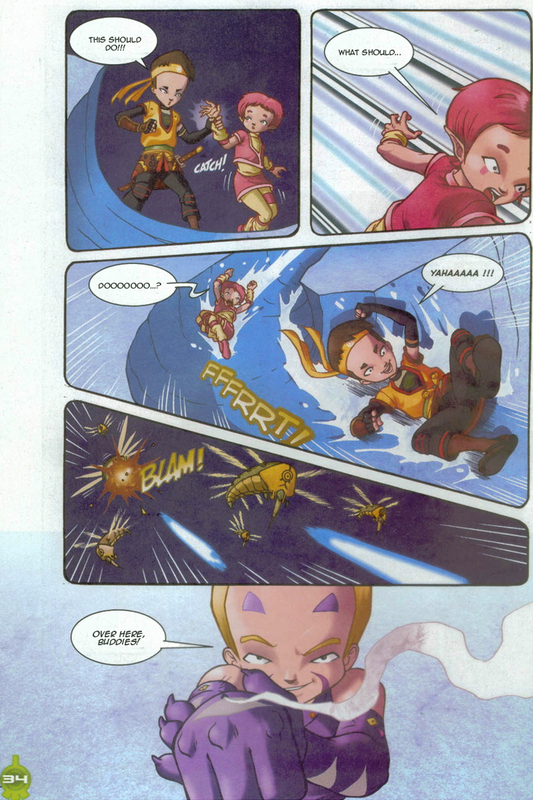 Jeremy teaches the Code Lyoko to Aelita and then virtualises the foursome of Lyoko Warriors into the Ice Sector. The welcoming committee is large: 10 Hornets. Luckily, the tower’s not far away. 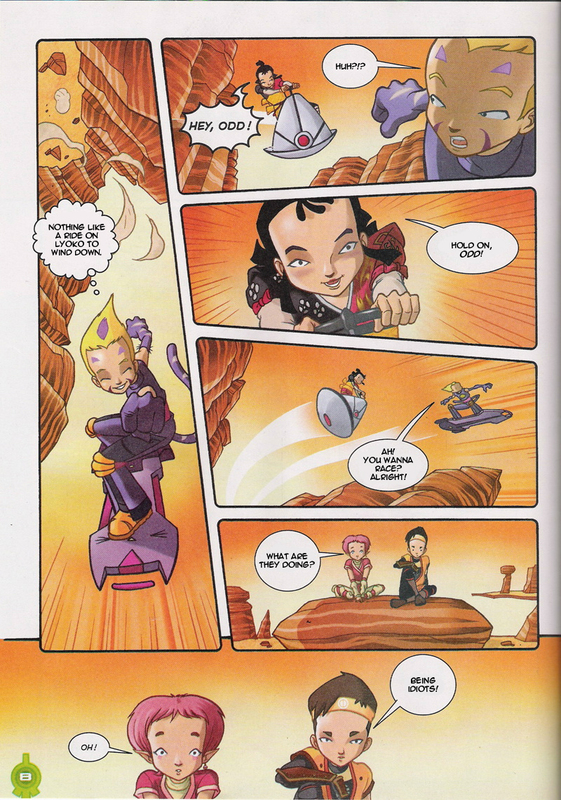 Ulrich leaves with Aelita while Yumi and Odd confront the monsters. Odd destroys a Hornet early on and Yumi destroys two. The small victory doesn’t do them much good however: they’re both devirtualised. Nonetheless thanks to an ice slide, Aelita gets to the tower with ease. Unfortunately, when she arrives inside, she takes a while remembering the Code Lyoko. 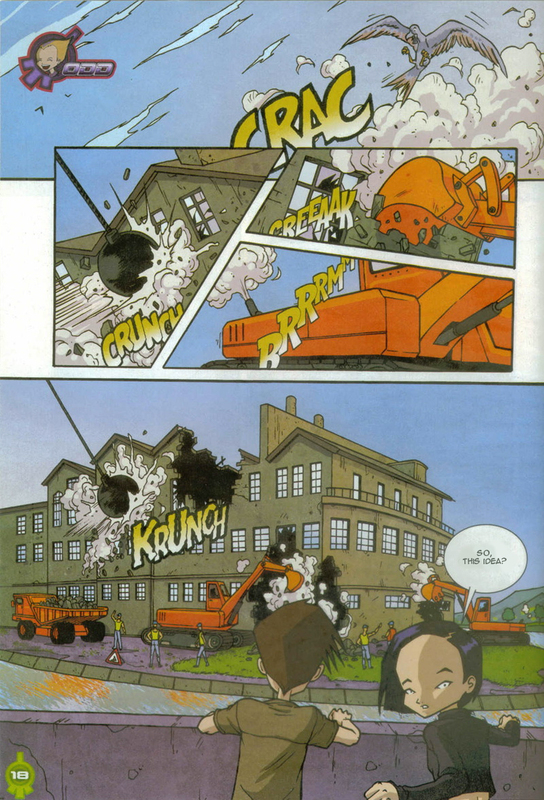 During that time, the bulldozers burst into the factory and approach the lab… Ulrich is devirtualised, victim of the earthquakes shaking the factory and the Supercomputer, also causing debris to fall on the terminal. Aelita suddenly remembers the Code and types it in. The Return to the Past is then launched. - A bulldozer breaks down a wall in the lab, however this room is underground. 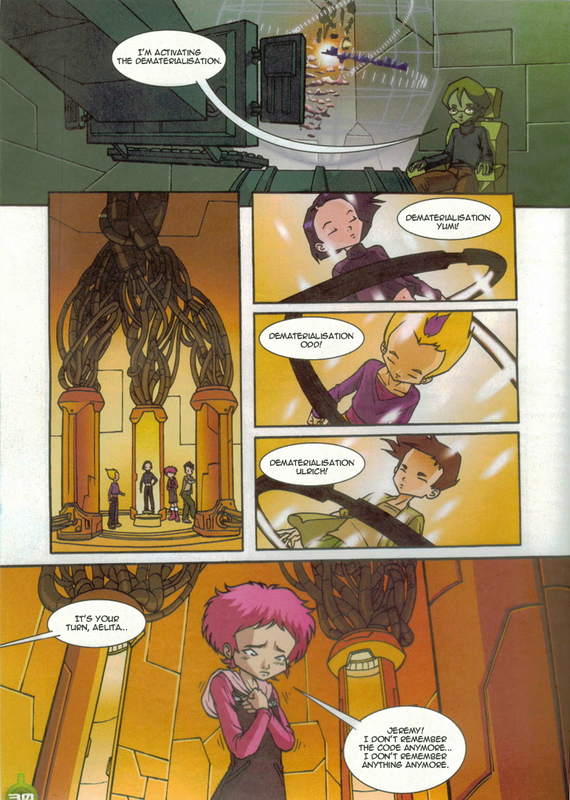 - There's a blackout that causes Aelita to have amnesia, but the scanner room and the lab run off the Supercomputer's battery power. - Jeremy calls virtualisation “dematerialisation”. - The activated tower doesn't have a red halo. - Hornets shoot from their beaks instead of their stingers. - Yumi is devirtualised by Hornet debris. 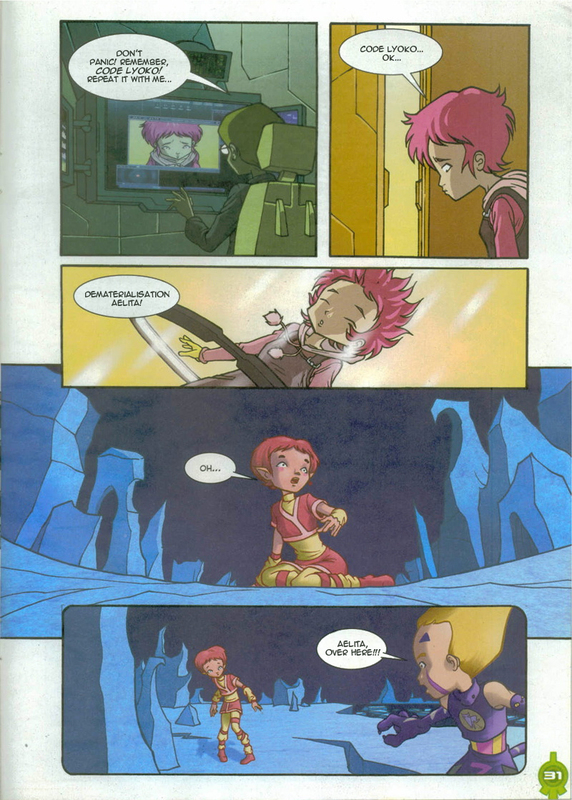 - Aelita enters the Code Lyoko by saying it instead of putting her hand on the interface. - On Lyoko, Yumi doesn't have her white make-up on her face during her race with Odd. 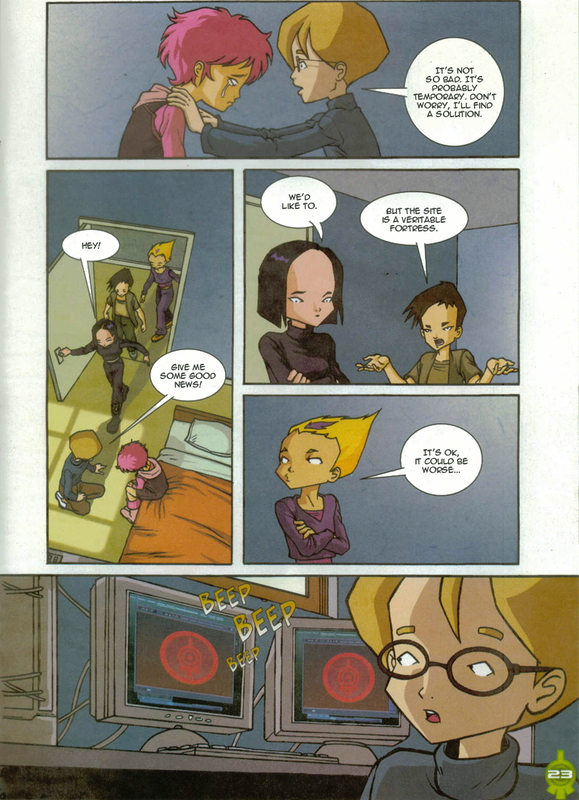 - On Lyoko, the marks under Aelita's eyes are missing in certain panels. - Jeremy's shoes are white instead of blue in certain panels. - The top of Aelita's shoes are dark pink instead of white and her boots are pink instead of dark red in every panel in Jeremy's room. - Odd's pants are the one shade of purple when he's on the factory bridge. 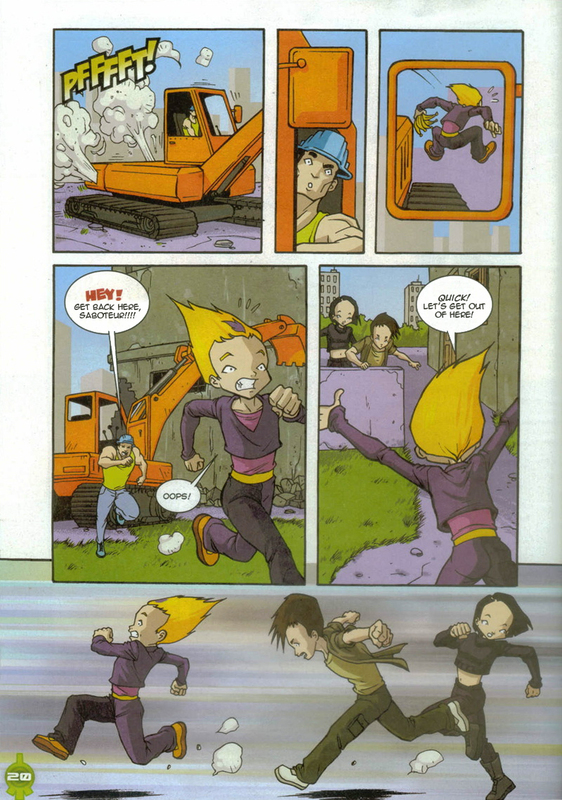 - The splotch in Odd's hair disappears in some panels. - The race between Odd and Yumi is similar to the one between Odd and Ulrich at the start of episode 27 “New Order”. 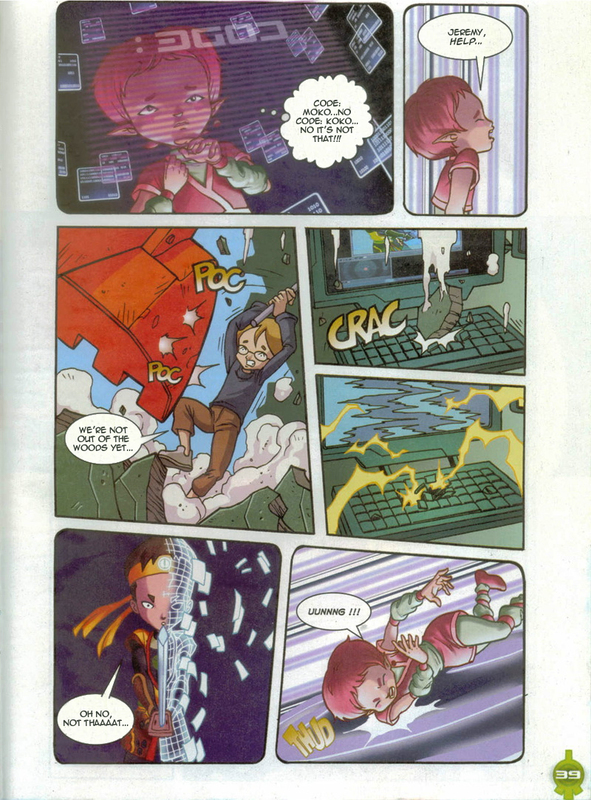 - The story takes place during season 3, as Aelita can be devirtualised without going through a tower. - Title invented for the sake of the gallery. The comic doesn't actually have one. However, the title given on the release of the standalone comic in hardcover is Panic at the Factory. Aelita (watching Odd and Yumi race): What are they doing? Yumi: What, is that all you can do? Ulrich: Yumi = 1, Odd = 0! Aelita: It's nothing, Odd… The important thing is to participate! Yumi: Meanwhile, I'M the boss! Jeremy: Yes, Ulrich! It's quaking on my end too, come in quickly!!! Odd: Everyone in one piece? Jeremy: Where's Aelita? AELITA! Aelita, wake up! Aelita: Nnnnn… Where am I? Jeremy: There was a blackout. Jeremy: No, everything started shaking. Odd: Hey! You'd better come see this! Yumi: That's not possible, they're going to destroy the factory! Ulrich: But what are we going to do? Jeremy: We have another problem! Aelita: Who are you? And me, who am I? Ulrich: What do we have to do? Boss: GO ON! FASTER! KNOCK THAT WALL DOWN. Odd: Hey! Sir, what are you doing here? Boss: BOY! I should be asking you that, there will be no walking around on my site without a helmet. Odd: Ah? But you don't have the right to do that! Boss: Of course I do! And in place of this OLD FACTORY, there will be brand new buildings! Odd: But you can't do this, it's our factory! Boss: I CAN do it and I WILL do it, go on, buzz off you little brats before I have you thrown out! Ulrich: We can't move the Supercomputer out? Jeremy (pensive): She's totally up the creek! She barely remembers my name. We have to find a way to stop the workers! Odd: I think I have an idea! Yumi: So, what's this idea? Odd: No, you're going to see how we're going to stop the machines!!! Worker: HEY! Get back here, saboteur!!! Odd: Oops! QUICK! Let's get out of here! Other worker: They went this way! Yumi: ODD, do you have any other BRILLIANT ideas? Ulrich: That was destined to go wrong. Ulrich: Mind explaining how we'll get back in now? Yumi: STOP! Let's forget about this for now…let's go see how Aelita's doing. Jeremy (holding a photo of the group): And here? Do you recognise anyone? Aelita (tears in her eyes): No, sorry. Jeremy: It's not so bad. It's probably temporary. Don't worry, I'll find a solution. Jeremy: Give me some good news! Ulrich: But the site is a veritable fortress. Jeremy: IT'S WORSE!! XANA's activated a tower. Yumi: We have to get back to the factory urgently! Odd: But how will we deal with the guards…? Ulrich: Don't forget the dogs!!! Jeremy: Think about it, what do dogs hate the most? Jeremy: Good, everyone knows what to do? Odd, Ulrich and Yumi: Yes! Aelita (trembling): Jeremy! I don't remember the code anymore…I don't remember anything anymore. Yumi: There is is, I see it! Odd: Yeah, and that's not the only thing I see!! Ulrich: Take care of them…I'll cover Aelita. Odd (to the Hornets): OVER HERE, BUDDIES! Ulrich: We're there! Aelita, it's your turn. Yumi: Paradise isn't where you're going, you beast! One of my… NOOOOO! Yumi: I'm ok, what's going on here? Ulrich: GO ON, COME OVER HERE IF YOU DARE! Aelita: UUNNNG!!! Mmmmpfff… The code…of course! CODE LYOKO!!!! Boss: Ah! Might I ask WHY? Jeremy: The river seagull is a protected species and you're going to destroy its habitat! Ulrich: And it can cost you dearly!!! Boss: ACCURSED ECOLOGISTS!!! I'm calling my lawyer, he'll sort it all out…come on, we're packing up. Aelita: You think that'll work? Jeremy: I've already sent letters to all the conservation organisations. The whole world knows about this! Odd: You're the best, Jeremy! Jeremy: NO! We're the best…TOGETHER!